Holy Satire, Batman, Look! Up in the sky! It’s a bird… it’s a plane….its SuperLBJ! 1966 was a year when comic strip superheroes POP! came to life and real life heroes SOCK! appeared in the comics. 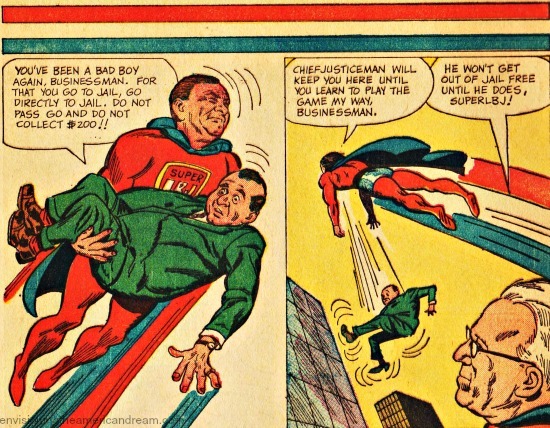 While that caped crusader Batman got his own hit TV show and the Man of Steel Superman starred in his own Broadway musical, The President of the United States Lyndon Baines Johnson got his own comic book. 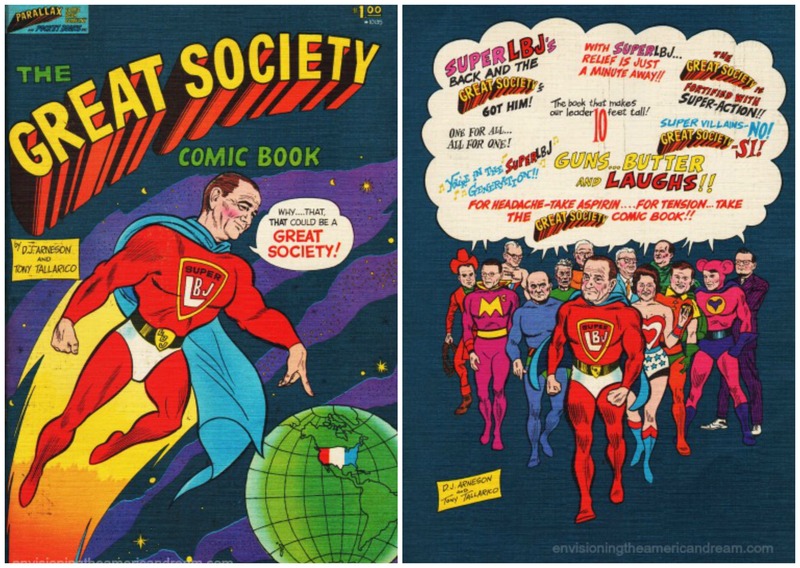 The Great Society Comic Book published in 1966 was a political satire of the Johnson administration and his Great Society programs.Lampooning political figures cast as superheroes, it followed the adventures of SuperLBJ. 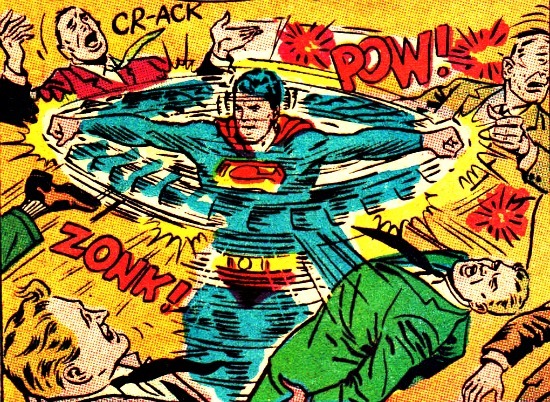 Comic books, a place where bright colors forever defeat darkness and good forever triumphed over evil was the perfect metaphor for the noble venture of LBJ’s Great Society . Lyndon Johnson wanted to build a great society for all Americans. His Great Society was a set of ambitious domestic programs aimed at eliminating poverty and social injustice. LBJ’s vision dovetailed thoroughly with the American Dream of a more perfect society, representing the hope and idealism of liberal mid-century America. With powers and abilities and ego far beyond those of mortal men,LBJ would pass more bills for his Great Society than any other president in history. In sweep and scope he rivaled FDR’s New Deal, improving the lives of millions of Americans. In today’s environment of legislative stalemate it is awe-inspiring. Yet he is best remembered for the tragic debacle of Vietnam. Hold it Reader! We know the question spinning through your mind How did this turn of events come about? For the answer let’s go back in time. 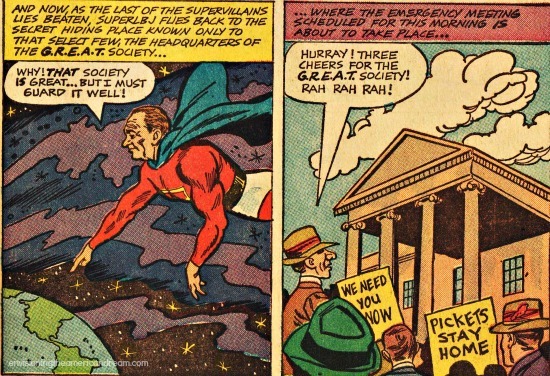 Like Superman, LBJ was a product of the Depression of 1930s. Unlike Superman, who disguised as timid Clark Kent was mocked as a freshman in college, freshman Lyndon Johnson rode into Congress like the wild bronco from Texas that he was, commanding respect. A New Deal democrat he was in awe of Roosevelt’s progressive programs that included public works projects that moved mountains, changed the flow of mighty rivers and raised buildings that touched the clouds. In many ways it seemed as if anything was possible of Americans. A true political operator, Johnson rose to power eventually becoming House Majority leader. The Texas size 6 ft 3″ 204 pound hunk of perpetual motion was renowned for his domineering personality and the “Johnson Treatment” -he was not shy in his coercion of powerful politicians in order to advance his legislation. Powerful as Senate Majority leader he would be sapped of his power as Vice President and presided in the shadow of President Kennedy after JFK’s assassination. Though the hold of the Kennedy legend on the American imagination was still powerful, after November 1964 he was elected to the presidency in his own right. JFK had been mythologized into a hero of mythic proportions, but LBJ would be no ordinary hero- he would be a superhero fighting the never-ending battle of truth, justice and the American way. 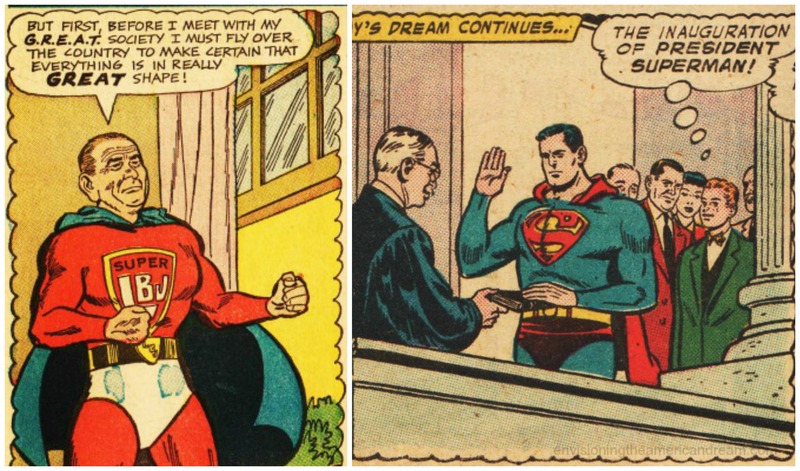 Taking office as president with his unlimited super powers and unwavering commitment to truth, justice and the American way, LBJ vowed, like Superman, to spend his days fighting crime, injustice and helping those in need. Danger and challenge were nothing new to SuperLBJ who warded off all threats with his quick thinking, resourcefulness and his superb legislative skills. But now faced with menaces so formidable that ordinary powers were not enough, the caped crusader would become superlegislator. Confronted with urban decay, poverty, crime and civil injustice, SuperLBJ would protect and serve the powerless and innocent becoming the champion of the oppressed. With supersonic speed he passed more legislation than thought humanly possible with cunning and determination far beyond that of mortal lawmakers, as a blizzard of Great Society legislation swept through Congress. Zap! He would eliminate racial discrimination with historic Civil Rights Act of 1964 and Voting Rights Act of 1965 and Pow! Poverty and urban decay would be eradicated with his War on Poverty! Bam! Medicare !Wham! Medicaid! Zow! Education, immigration, environment, the arts! For a year the world watched in awe as SuperLBJ used his amazing array of superpowers. While LBJ dreamed of a Great Society his presidency was haunted by the specter of Vietnam. 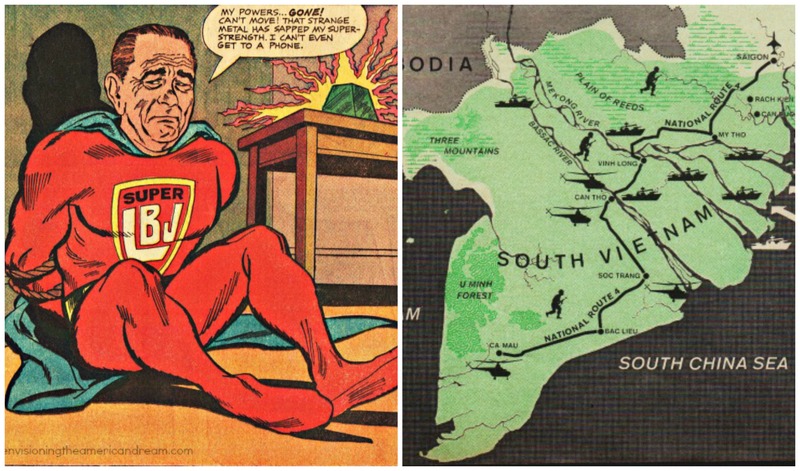 As SuperLBJ he believed he could support both guns and butter, but soon much of the funding he had hoped to spend on social reforms went towards war in South East Asia. The escalation of bombing in Vietnam was not working. Even Robert McNamara, Secretary of Defense in his administration was losing confidence in the ability of the massive bombing to bring the enemy to its knees. 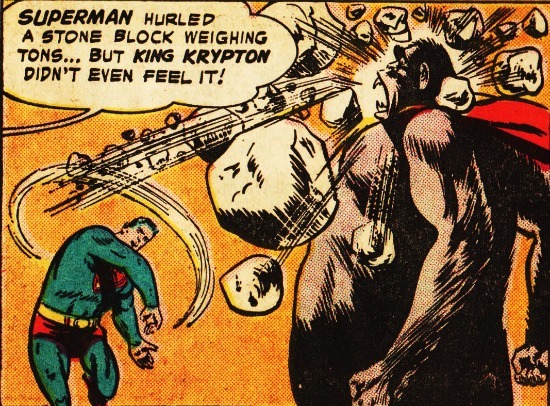 Just as Superman met his challenge with a super beast who seemed immune to his strength and powers, Vietnam would be the Monkeys on LBJ’s back. By fall of 1966, the conservative Congress goaded LBJ on passing huge military appropriations bills encouraging him to sink ever deeper in the Vietnam mire. Behind a veil of secrecy the war escalated and the cost of the war skyrocketed. The press had sensed a credibility gap between what LBJ was saying in press conferences and what was happening in Vietnam. But LBJ was passing huge amounts of social legislation through Congress. If the true cost of the war were known, LBJ feared that the Great Society would come to a shuddering stop. By the end of 1966, Vietnam would turn out to be LBJ’s kryptonite sapping him of his strength, funding and dreams of a Great Society. Just as Batman’s final episode would be in 1968, so LBJ bowed out of politics by announcing on March 1968 national television that he would not run for a second term as president. His decision was in large part a consequence of declining public support, a credibility gap for his policies in Vietnam. Pingback: LBJ’s Great Society Was a Great Idea | The Omnipotent Poobah Speaks! LBJ did what any good democrat does, he stole my Social Security and used it pay for the war on Poverty and now SS is bust and we have more poor than ever.